Moment-by-moment it's powerful, but overall it's strung together, strung out, and strains for effect. There is a lot of talk in Talk to the Demon, by Belgian director Wim Vandekeybus for his company Ultima Vez. Which prompts the question: who is the demon of his title? If we are looking for characters who seem not quite human, three possibilities spring to mind. 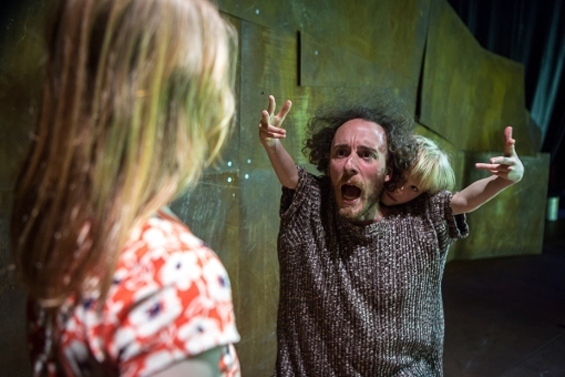 It could be the two children of the piece, Martha Killick (aged nine) and Luke De Bolle (seven), who play power games with the six adult performers, making them pretend to be cows, or setting underhand challenges with prizes of chocolate. Or maybe it’s the grown-ups, who feign protectiveness but tell the children lies, react with exasperation to their reasonable questions, and often act like big monsters themselves. When, early on in the piece, young Martha marches towards the audience and says, “We need to talk”, there’s even a suggestion that the real demon is us. talk to the demon or talk to the hand? In fact, Vandekeybus plays with all these combinations – and more. On several occasions, two performers conjoin to form a single, composite creature, the voice coming from one head while the arms gesticulate from another’s body. This produces a disorientingly mixed message: talk to the demon or talk to the hand? In another scene, ideas themselves become invisible forces with magic powers – the idea of tiny particles that spread around and make people ill; the idea of words you can see but not speak; the idea of children being shut into a building together every day, just to give their parents a break. In several chillingly effective scenes, the stage seems invaded by nightmare figures. Elena Fokina crawls forth like the devil woman from The Ring, hair hanging over her face and every move accompanied by crackles of static. The scene in which the grown-ups amble on in clown costumes, a cohort of ghoulish pierrots and soulless jokers, is pure Stephen King. The energy of the piece is palpable, but it is also unharnessed. Scenes may be individually striking, but collectively feel strung together, even strung out. Some are vacuous or, worse, gratuitous. The hellish tales of war and depravity told to Martha – stories stretching towards necrophilia and cannibalism – had me mentally rerunning the scene in a version without children onstage. They still felt unwarranted. Whether or not Martha heard them all – she seemed to have covered her ears – please, not in front of the children, Wim. That’s straining for effect.